The club, at East 10th Street and Avenue A, is running the pilot program “Knockout Obesity,” which was developed by Dimitrios Verteouris, a restaurateur who once weighed 330 pounds. 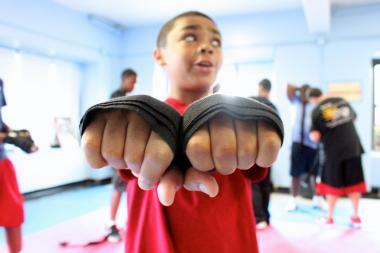 The five-week program enlists boxers such as Shemuel Pagan, a five-time New York City Golden Glove champion, to teach Boys’ Club members proper boxing techniques for fitness while also explaining how to eat right and the consequences of poor nutrition. On recent Wednesday afternoon, Pagan and Verteouris quickly got the class of teenage boys to work up a sweat with jumping jacks and pushups as well as footwork and boxing drills. After Verteouris’ own struggles with food and weight, nutrition is crucial to the program. “I don’t think they [Boys’ Club members] understand the consequences of a bad diet — ‘Hey, this can actually kill you,'” Verteouris said. Dr. Wendy Scinta, a weight loss and nutrition expert, already started working with the teens during the first session when the program started last week. “Nutrition is the most important part of this program,” Verteouris said. Click here for article and slide show on DNAinfo New York website.